Abstract. The human inferior parietal lobule (IPL) is a multimodal brain region, subdivided in several cytoarchitectonic areas which are involved in neural networks related to spatial attention, language, and higher motor processing. Tracer studies in macaques revealed differential connectivity patterns of IPL areas as the respective structural basis. Evidence for comparable differential fibre tracts of human IPL is lacking. Here, anatomical connectivity of five cytoarchitectonic human IPL areas to 64 cortical targets was investigated using probabilistic tractography. Connection likelihood was assessed by evaluating the number of traces between seed and target against the distribution of traces from that seed to voxels in the same distance as the target. The main fibre tract pattern shifted gradually from rostral to caudal IPL: Rostral areas were predominantly connected to somatosensory and superior parietal areas while caudal areas more strongly connected with auditory, anterior temporal and higher visual cortices. All IPL areas were strongly connected with inferior frontal, insular and posterior temporal areas. These results showed striking similarities with connectivity patterns in macaques, providing further evidence for possible homologies between these two species. This shift in fibre tract pattern supports a differential functional involvement of rostral (higher motor functions) and caudal IPL (spatial attention), with probable overlapping language involvement. 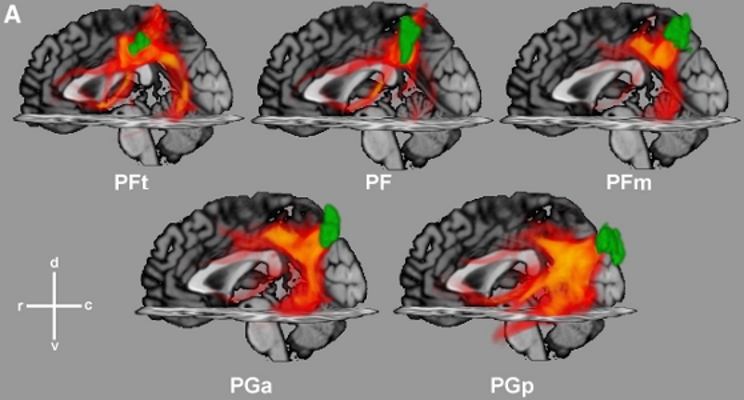 The differential functional involvement of IPL areas was further supported by hemispheric asymmetries of connection patterns which showed left–right differences especially with regard to connections to sensorimotor, inferior frontal and temporal areas. Probabilistic tractography results for five IPL seed areas, ordered from top-left to bottom-right in a rostral sequence and overlaid with the respective cytoarchitectonic seed region (green), for left hemisphere. Probabilistic fibre tracts, projected back from individual diffusion spaces into anatomical MNI space, are displayed with regard of the uncertainty of tract traces (among others due to interindividual variability), as revealed by the probabilistic tracking algorithm. The density of traces is colour-coded from opaque yellow for low to transparent red for high uncertainties. Traces are projected onto the sagittal and transversal planes of the MNI single subject template for anatomical orientation. c caudal, d dorsal, r rostral, v ventral.